I am writing you this open letter as a concerned South Australian. Please don’t shut down your Holden manufacturing business in Australia. I know you are working hard with the big wigs at General Motors in the US, and I know Australia’s most incompetent Prime Minister of all time is making your job really difficult. But I just hope you don’t let Abbott’s stupidity destroy the car manufacturing industry in Australia forever. Note the word ‘adult’. I guess that sort of statement put lots of uninformed voters at ease. But what’s not putting anyone at ease now is the realisation that the words Abbott used to describe his potential behavior as Prime Minister appear to be the opposite of how he actually intended to behave. Calm. Mature. Adult. More like rabble. Chaos. Childish. Joke. In fact, Abbott’s government is turning out not just to be a comedic joke, but is actually becoming depressingly dangerous. And their shenanigans in their negotiations with your business could be their most damaging legacy. I’m guessing you, like me, are beside yourself with rage that Abbott would be so flippant about a decision that is going to destroy the lives of thousands of Australian workers and their families. I know you know all these facts, but I’m reminding you again to show just how serious this situation is. 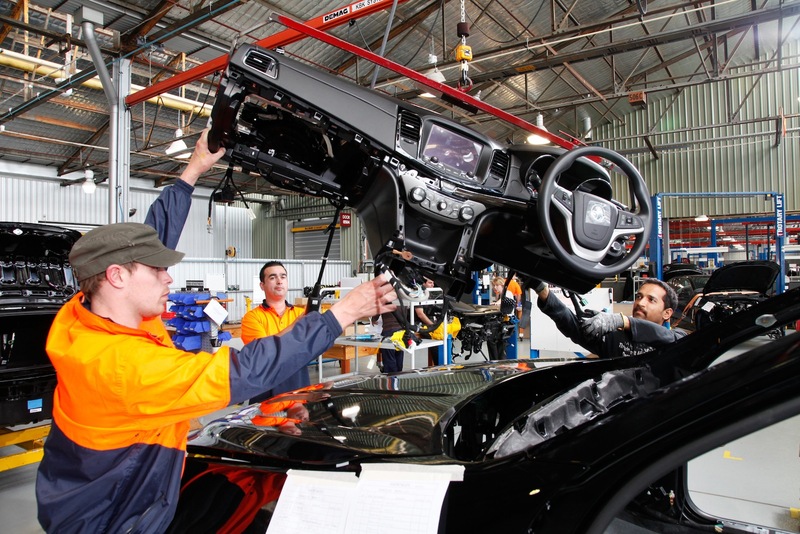 In Adelaide, Holden’s decision to leave Australia could cost 30,000 jobs when you include all the component and parts manufacturers becoming unviable after Holden leaves. Anyone with the ability to count can easily understand the economic equation in favour of providing government funding to Holden to enable you to keep producing cars in Australia. Quite simply it will cost the country far less in monetary and social costs to give Holden government funding to stay, rather than paying possibly generations of jobless members of our community a lifetime of unemployment assistance once their industry disappears. All us rational thinkers understand why every car producing country in the world provides government assistance to car manufacturers. The benefits of keeping a manufacturing industry alive instead of crushing communities through endemic unemployment are impossible to quantify in monetary terms only. But the problem we’re facing is that the man who is in charge of the decision to provide the government assistance your company needs to justify making cars in Australia, is too incompetent to make the right decision. You see Mike, as I’m sure you’re finding, this is all a big game to Abbott. He thinks he’s playing chess with you, but the problem is, he doesn’t even know how to set up a chessboard. He’s currently bouncing sideways like a broken ping pong ball, reiterating that the government won’t give any more funding to car manufacturers, whilst also contradicting himself by putting off an official announcement until after the Productivity Commission delivers their report, whilst also ignoring your very clear deadline of Christmas this year. And now he’s saying he wants Holden to clarify your position, after his government colleagues have been leaking to the press about your apparent plans to shut down, which no one at Holden can confirm as fact. This is beyond chaos. This is farcical. We just need you to hold on Mike, and don’t let Abbott put you off Australia. I’m really sorry about his behaviour. I’m sorry this country was fooled by three word slogans. I’m sorry so much of the business community got behind Abbott too. To think, Abbott claims his government is open for business. But apparently, Mike, no one read the fine print on this slogan. You see, Abbott is only open for business if you are open to helping him, personally. He doesn’t care about Holden workers’ jobs. He only cares about him and his mates. Like Gina Rinehart who is set to reap great returns from her investment into Abbott’s campaign, with Abbott currently working to remove the Mining Tax just for her and her fellow fat cats. And in doing this, he’s getting rid of tax revenue which could easily be used to fund the very affordable assistance to car manufacturers to keep you employing Australian workers. I can’t understand why even the most disengaged voters can’t see that this whole situation is blatantly ridiculous. And that’s the other thing that upsets me about Abbott’s stupidity. Rinehart’s mining industry, which gets various types of government tax-breaks and subsidies, employs only around one seventh of the number of South Australians employed in manufacturing in this state. And Rinehart can’t take her business elsewhere because the dirt she needs is here. If she is forced to pay a super-profits tax on her already outrageous profits, that’s no disincentive for her to run her business here, because she can only make the money here. This is how her father set her up for a million consecutive lifetimes of fortune. But Holden cars can be made anywhere. Anywhere a government values employment and productivity growth. Anywhere a government understands the multiplier effect of investing in an industry to support the economy. This is simple economic theory. Again, I know you know this, but I’m just trying to show you that I feel your pain. I implore you Mike. Don’t let Australia’s village idiot of a Prime Minister ruin this great country through sheer ideological fundamentalism and intellectual inadequacy. And please let me know if there’s anything I can do to help keep Holden here. Will he read it? – or is it only people who are already frightened for our future here Downunder who will, I wonder …? Marvellous piece. Excellent & very well written Victoria. Only wish Mike Devereux could read this. One of the reasons Abbott is exhibiting such apparent laissez faire about this is due to his & the Liberal party’s fundamental ideological hatred of unions. They see this simply as a means of shattering the unions’ influence & funding. They do not give a fig about destroying families & businesses. Ideology rules all of Abbott’s thinking (such as it is) & actions..
Strangely, many of those who back his inaction, re the car industry, are the very same whose own jobs & income could be affected by similar acts of political bastardry. They do not understand there isn’t one country in the world, where cars are still manufactured, that does not subsidise this industry. Some are to a greater extent than here. When Pacific Brands closed its factories here & went to low wage China did their products become cheaper for the consumer? No they did not. Their lower quality product remained the same price or became even dearer. Only the shareholders reaped the benefit of destroying hard-working Australians’ lives. To blame Tony Abbott for the woes of GMH is a big stretch Victoria, its our high wages, and high dollar that have made made the future of Holden so dodgy, along with our small domestic market on a global level and as much as I want to see a viable manufacturing industry in this country how big a subsidy should we pay to keep a company who have not been responsive enough to the changing market? Besides the fact that they have continued to make big heavy cars that are less fuel efficient than the market demands we have the registration & insurance imposts being proportional to the number of cylinders in each car which makes running a traditional six cylinder car far more expensive than running a 4. In market terms its a fatal combo that has seen buyers looking anywhere other than GMH for their wheels. So? Lard-arsed Suburban assaUlt Vehicles are EXACTLY what people want. But, since I live in Melbourne’s leafy eastern suburbs and just about every day some idiot throws one at me, my perspective may be slightly skewed. To paraphrase your last post, Holden is a terrible business. They wilfully refuse to build cars which people will want to buy, fixating instead on V8 supercars because they are Sooo cool and rad. They have been propped up for decades by government subsidies, concessions, grants, and bailouts, and their only business plan involves perpetual handouts. They will never make a profit by building Bommodores, and they know it. Time to clear shop. I need your help and voice please. But skill to find the truth. Do you know if in AUD and NZ they are Geo Engineering and spraying the sky with Chemicals to change the weather pattern? This all sounds so crazy and madness. If what I am picking up is correct we need to act fast as our environment sounds like is getting sprayed with all sorts of nasty chemicals that are ending up in our lungs, boys and water/food source. Can you PLEASE help ahead some light. You wish to do anything to keep Holden alive in this country. What do you currently drive now? When did you last buy a brand new Holden car? These are important details that should have been provided with your letter. Soooooo . . . . do you drive a Holden?